If you thought wedding planning stress was bad, there's a whole new chapter of anxiety after you say "I do." 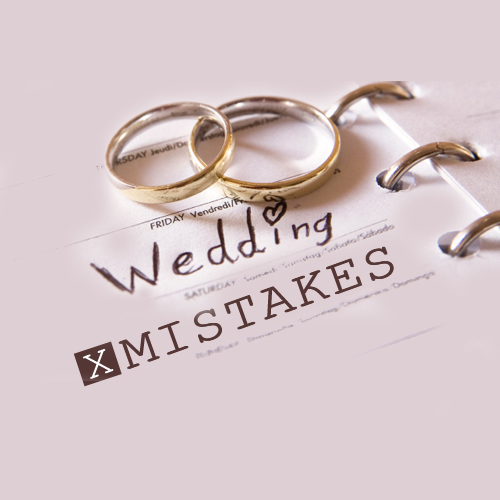 No matter how wonderful a wedding turned out to be, many women fall into the trap of re-hashing the big "mistakes" that went down on the Big Day, notes bridal counselor and author of The Conscious Bride Sheryl Paul. Even if it's just in an attempt to forewarn our friends who are about to walk down the aisle, we can't help but drive ourselves a little bit crazy about all the "disasters" that went down at the wedding. But some are obviously much more catastrophic and significant than others. The florist's (or another vendor's) bill suddenly doubling overnight. Unexpected changes have caused brides to contend with last minute charges that came out of the blue. Talk about an instant headache! Not letting Dad, Mom, or someone else near and dear express their deepest emotions. Whether it's about avoiding raccoon streaks from our mascara as we walk down the aisle or just wanting the day to be "perfect," brides often want to avoid emotional confrontations. But sometimes, having the hardest conversation or letting yourself embrace the most heart-wrenching moment is exactly what the day is all about. Failing to think/talk about how your relationships will change ... before the Big Day. With your mom, your dad, your best friend. All of these emotions have a way of rising to the surface on the wedding day if we don't tackle them in the days prior. Neglecting to discuss the final game plan and get the details in writing from vendors. And then missing out on something you really wanted, having to suffer through something you didn't want (NO disco! ), or suffering a hairy miscommunication as a result. Neglecting to delegate big projects to other people. That's what they're there for -- to make your life and your day less stressful! Not having hired a day of (or month of!) coordinator. Mostly to avoid having to stress out about all the little details up 'til the last minute or deal with those last minute changes from #1 that you don't want to stick your mom or bridesmaids with, because they have other major duties to tend to. Missing out on the food. Either before the ceremony, which can set you up for seriously low blood sugar. Or due to socializing and trying to stick to "the schedule," missing out on the dinner, the dessert and/or the cake you worked on designing for months! Throwing up your hands and "yes"-ing everyone to death. You may want to just give in and let your in-laws take the reins on eleventh hour details like the seating chart, but pick your battles wisely. Some things -- no matter how tedious -- could definitely be better handled by you and your fiance. Forgetting what it's all about. It's so easy to get caught up in the details, the "Big Perfect Day" ideal, what it's supposed to be that we often lose focus of what a wedding really is: The beginning of a lifelong commitment to another person. A rite of passage. If it doesn't go exactly as planned, it doesn't mean the marriage is doomed! It just means you've got something ridiculous to laugh (or, okay, cry) about for years to come ... together.